at the end of last year, i reported that i went through inexplicable weight loss when i nearly breached the 150-pound barrier. everyone noticed it and i was consistently quizzed about my diet and my exercise routine. but i could offer no logical explanation: i hadn't changed my consumption patterns and did not increase the intensity of my cardio workouts. i would often joke about eating unsanitary food which acted as some sort of laxative: my frequent trips to the toilet helped in getting rid of excess fluids. but oddly enough, just when i decided to re-ignite my exercise routines, i somehow found myself beginning the year with a resolution: to eat, and to eat well. yes, despite the rather unsavory beginning to this entry, i will be talking about all things gustatory in this post. 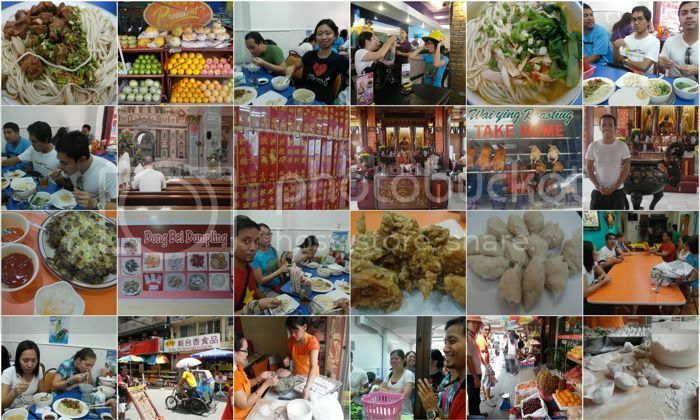 in the middle of january, i was asked by friends to take them on a walking tour of only-in-binondo restaurants. i had done this a few times, that i had become some sort of an authority on the subject. but i must confess that i know no more than what google allows me to discover about this place which is so strangely exotic, it may very well be in the outskirts of manila, though in truth it is in its very center. 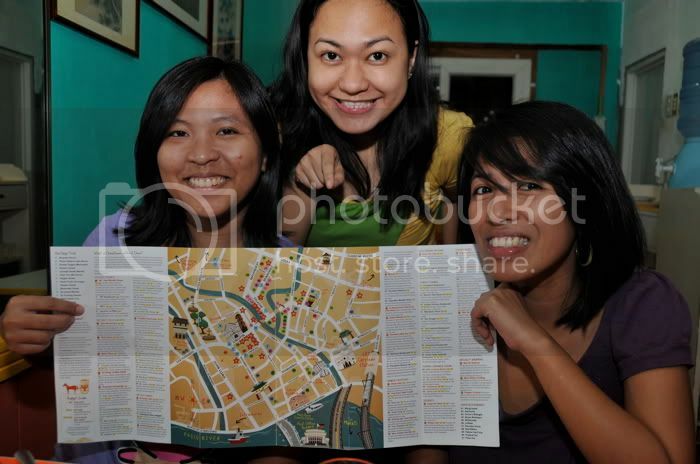 so hoping to expand my binondo vocabulary, i went out to get myself a copy of ivan man dy's big binondo food wok map. besides, i am a big fan of maps. i ran home immediately to study the map hoping to findinformation on new places to discover: my taste buds were salivating with excitement. but i may have put my hopes too high, and my researching skills too low. apparently, there was not much else to find out apart from what i already know. i was introduced, however, to a temple hidden on the fourth floor of an off-the-usual-route building, which we visited between helpings of oyster cake and fried chicken and hand pulled noodles. other than that, the map didn't wildly change my perspective. it would probably best serve those who know nothing about binondo (i.e., never been there) and are too overwhelmed by the idea to do independent research on available literature, and not just those found on the internet. the map itself is very nicely executed. the artwork is good and the information on both historical landmarks and holes-in-many-walls is brief but still helpful. the promos are also worth much much more than the P150 i paid for it. but ivan man dy should have employed the services of an eagle-eyed editor. although i wasn't eager to find faults, i spotted a number of mistakes, only because i was curious to learn. 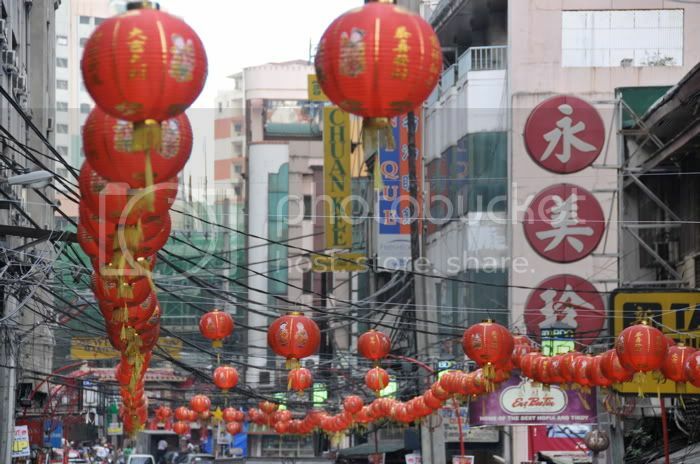 so the binondo tour was restricted to the usuals: dong bei dumplings, sincerity chicken, lan zhou la mien, masuki, and mezzanine café. as usual, the dumplings at dong bei were consistently superb, which is not something i could say about sincerity. it seemed to me that their chicken is becoming ever more generic, and the oyster cake, rubbery. the machang was also a bad choice. but lan zhou la mien had gotten even better from my last two visits. they'd moved right across the street, and now have twice the number of tables. what i didn't understand was why they had gotten a lower star-rating on the binondo map than masuki, which i felt served less-than-special siopao. i suspect that ivan man dy's reviews of the restaurants were somehow tainted. i didn't completely agree with his conclusions. 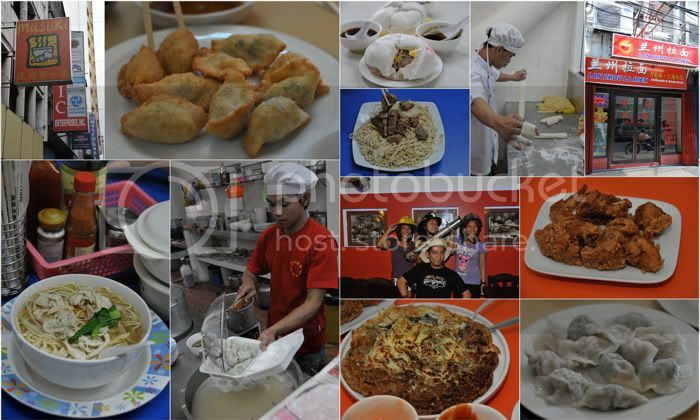 mr. ube still looks too commercial for me, and i would prefer to visit places that you find only in manila's chinatown. recently, i repeated this trip for couchsurfers. my friend jay asked me to organize the trip with the addition of taking some of manila's unique forms of transport which i've also done before. and i'm not talking about the calesa nor the pedicab. much more special than that. after doing the degustation tour of binondo in much the same way as we had done above (except we had no more space for masuki) with more than 10 couchsurfers, including a brit who's volunteering for leonard cheshire, we moved on to taking some unique rides. we narrowly missed the ferry so we walked to carriedo for the LRT-1 and went to blumentritt and got there just in time for the next train. it was everyone's first time to ride the philippine national railways. we were kind of noisy inside, and they were all thoroughly impressed with the fact that it was a) airconditioned; b) smooth; and c) on-time. we got off at the pandacan station to take rail skates back to santa mesa, in front of PUP. as before, the skates go over the pasig river, and it is quite literally possible to fall into the river since the bridge of the train has wide spaces in between the slats. i later found out, while we were on-board the pasig river ferry, that this was what most of them found quite exciting. since we had already passed malacañang palace when we boarded the ferry, most of us decided to stay outside despite the fact that sometimes the water splashed higher than we would have wanted it to. while it has somewhat improved, i don't think it would be wise counsel for anyone to say that it is safe to swim in it. nonetheless, despite some unsavory scenes along its banks, it was (it always is) a pleasant ride. we took the ferry all the way to guadalupe. upon getting here, i thought we would part ways and go home and i was beginning to give instructions to people on how to get to where. but jay wanted to eat and asked if it was possible for us to get to som's without taking a cab. i said yes, provided they could endure a 15-minute walk. so we got off at rockwell, walked through powerplant, and before dark were all at som's. i've been going to som's for 5 years now. i witnessed its evolution, from a few tables on the sidewalk and a house converted into a kitchen to opening another branch in reposo to its current state: an airconditioned and brightly-lit restaurant with white tiles and a high ceiling. the new building is courtesy of the lot owner, and som's was offered the right of first refusal to operate the restaurant on its first level. although there is nothing "thai" about its current state, at least they get to serve more people. some months ago, i complained about how the food there had gone terribly bland, but i think there may have been changes in the kitchen because lately, i have not found myself complaining (welcome back, chef!). that day, we ordered all sorts of things and were so stuffed by the end of the day most of us were surprised how fast time flew, and how little we spent. 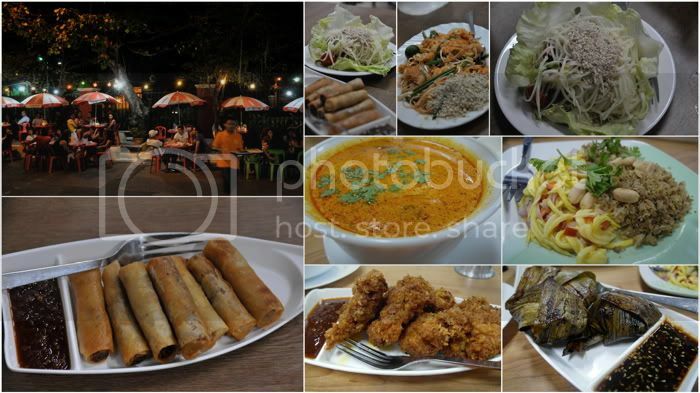 for all those gustatory delights, we spent only over P400. burp! i'd continue some more about what i've been eating lately but this might be a sensory overload, so i'll reserve some for a later post. asenso na ang Soms. May building na! i know right? pero i still miss the authentic bangkok sidewalk feel. dito lang naman sa pilipinas may masamang imahe ang mga carinderia. kung marunong ka lang maghanap, may mga tabi-tabi dyan na masarap naman. kelangan mapuntahan lahat ng yan!